Forever Metals offers Free shipping. 30 Day hassle Free returns and exchanges. Express shipping is available. All products come with a lifetime warranty. Rings are comfort fit and run true to size. Items ship when ordered prior to 3:00 PM central standard time. Custom rings and laser engraved orders please allow 2 weeks for manufacturing. Free wooden ring box with each purchase. Attachment in JPG Format Your ring design, artwork, hand written message, hand or finger print. Forever Metals offers a 30 day exchange on all new unworn merchandise. Exchange for a different size, a different ring style or an engraved product. If the requested ring is higher in the dollar amount then we will send you an electronic invoice to pay the difference. If the ring requested amount is less than the current style we will credit your account once the ring is received. Custom and engraved orders are handcrafted to specifications and are a final sale which may not be eligible for exchange. Customers assume all shipping and handling charges when exchanging to and from our facility. Engraved requests and exchange(s), please checkout above by adding the FREE exchange and preferred engraving to the shopping cart. Exchange(s) only add 1 or multiple exchange request(s) to the shopping cart. There are no exchange fees, however you must pay a preferred return shipping method. Return shipping acts as our return postage back to your location. Once return postage is paid, return your merchandise to the follow address. 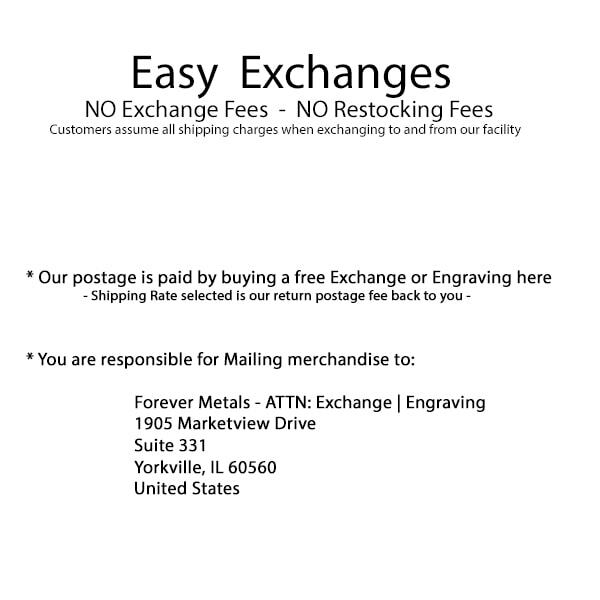 Your exchange or engraving will be processed once your package is received.